Starting with 25 May 2018, the EU General Data Protection Regulation (GDPR) will supersede current national data protection laws of all EU Member states. More information about this regulation can be read on their website and if you want to ensure the right measures are taken for the GDPR compliance of your website, you should seek legal counsel. If you use Profile Builder to register or manage users, you are affected by this law as well. 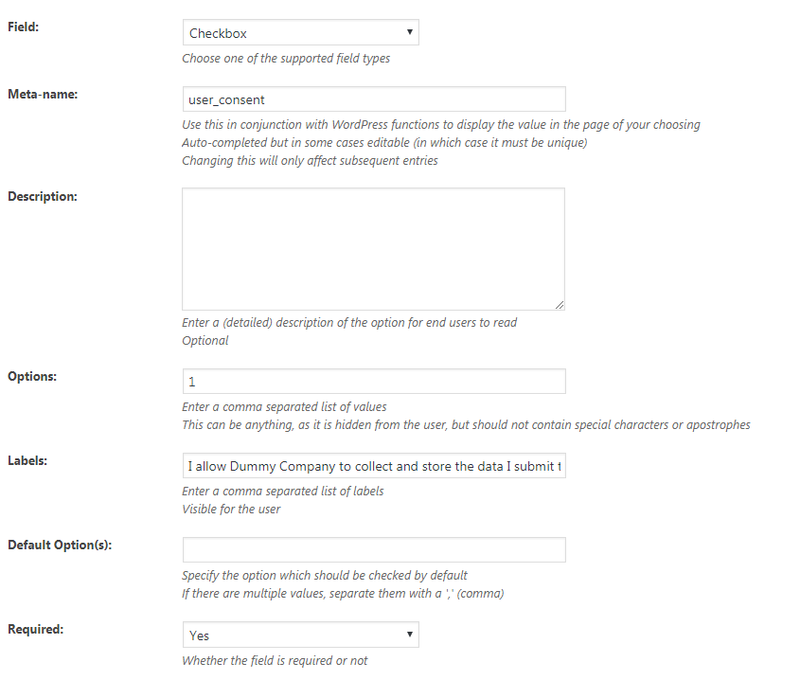 This page looks to provide information about how to make forms created with Profile Builder – GDPR compliant. The first thing you need to do is ask the user for his permission that you collect his personal data with the intent to store it. Method 1: Since Profile Builder 2.8.2 you can find a dedicated Checkbox field for this functionality, both in the free and paid versions. 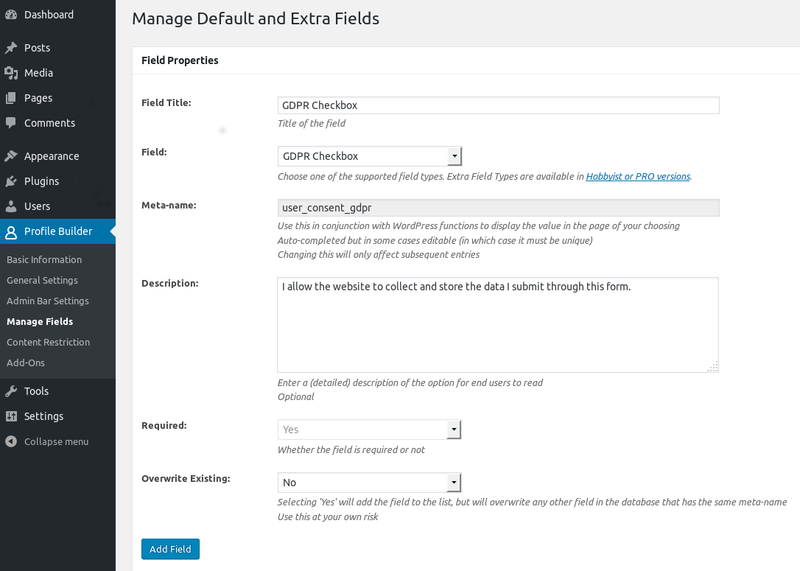 Go to Profile Builder -> Manage Fields to configure and add it to your form. The data we store is associated with a WordPress user account and stored in the standard `*_usermeta` table. Easiest way for users to view it is to go to a page which has the [wppb-edit-profile] shortcode, this will also allow them to edit it. Another way to let them view it is through the Single view of our Userlisting module. As an admin, you can also provide an export of this data, if requested. You can find instructions for how to do this here. As an admin, to delete an user, you can go to your Dashboard -> Users page and then hover over the user entry and press Delete. This will remove the user account and any data associated with it. There’s also the possibility to allow users to delete the account themselves. In order to have this option, you need to download and install this add-on. Pressing the button will trigger a confirmation box and if this is validated the user account and all data will be deleted. If you have any questions about these implementations you can always send us a ticket.